Outline: If you have recently upgraded to a new tablet and want to hand off the older model to your lucky kids, there are a couple safety measures we recommend you put into place to make your tablets safe for kids. Have you have recently upgraded to a new tablet and want to hand off your older model to your lucky kids? That’s a good idea, but before you do there are a number of steps you should take before you let go of that older tablet. Even a beat up, older model is still useful, albeit a bit slower than your new tablet, but you might want to make sure it’s safe for your kids to use. Kids drop things – a lot. (Well, so do I, but that’s not important.) 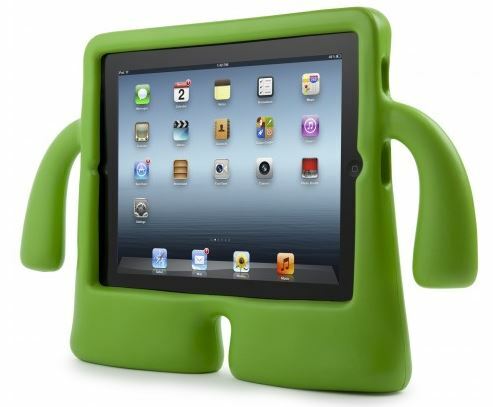 A rubberized case will protect your tablet from most drops, so it’s well worth the investment. If you’ve been using your old tablet for any length of time, chances are good that there are any number of things on your tablet that you don’t want other people to see. It might be as simple as work emails you don’t want anyone to read, or perhaps you don’t want your reading habits shared with the world. In any case, the best way to make sure that all of your personal documents are removed is to reset the tablet to factory settings. With most tablets this will wipe all of the internal storage, remove any apps you’ve installed, and delete any changes you’ve made to the settings. The steps involved vary between tablets, but you can probably find the reset option under the Settings menu on your tablet. Just make sure that you save any important files first. If you would like to restrict what a kid can do with the tablet (block games, inappropriate content, and so on) then you should install a parental control app. I’m not sure I would take this step, but you might want to. There are a lot of websites, Youtube videos, and apps that aren’t appropriate for small children. There are a number of apps which would work. One Android app you could try is Kids Place. I came across it when I reviews the ClicknKids tablet, and on that tablet it blocked access to any app which had not been selected and approved by the parent. I thought it worked well, but if you don’t like it there are many other alternatives in Google Play. Of course if you have a Kindle Fire, that tablet has parental controls built in. So does the iPad. We’ve all read the horror stories about kids running up thousands of dollars in charges, right? You don’t want that to happen to you, so you should probably make sure that your tablet asks for a password before any purchases. On Android tablets, both Google and Amazon have a parental control option under the settings menu which can be set to require a password before any purchases can be made. On the Kindle Fire, this setting is found with the other parental control options. On the iPad, I would suggest a different approach. I would set up a separate account just for the kid’s iPad. This is extra work, but it will allow you to remove any chance that the kid might run up charges in iTunes. If you need to make purchases for the kid’s iPad, you can buy a gift card with the parent account and give it to the child account. As a final step, I’m going to suggest that you install an alternate web browser. There are any number of child safe web browsers in Google Play and iTunes. The 5 suggestions in the above post are really just a start on what can be done to child-proof a tablet. If you have any suggestions for other apps to install, don’t hesitate to leave a comment. 1. If you have collected lots of HD Videos (H.265, MKV, AVI, Tivo, FLV, etc.) and Songs (such as FLAC, AAC, AC3, M4A, WMA, etc.) for your kids, and want to transfer these files to kids tablets for your kids enjoying at home or on the go. Here we throw a Video Converter and a quick tutorial up on how to play video on songs on your kid tablets, which will definitely get you to do a double take. 2. If you want to put DVDs to kids tablets for playback effortlessly in a short time, you need to find a good enough DVD Rippers for your kids tablets. Aimersoft DVD Ripper will be your best choice here. This DVD to Kids tablets can help you to rip and copy DVD to all Kids tablets friendly video format like MP4, MOV, AVI, M4V, etc. at super fast speed with a best output video. Plus, this DVD Ripper can allow you to select preferred subtitles for your DVD movies. You can read the Review to learn more about the DVD Ripper. For Mac users, please get DVD Ripper for Mac. 3. More and More popular Kids Tablets walk into our life. How to make maximum use of the Kids tablets? Game, Music, Movies, Internet and shopping. If you have many iTunes videos, Amazon Instant Video, BBC iPlayer videos, etc., and want to move the DRM-protected videos to Kids tablets for your kids, just get the DRM Media Converter and follow the guide to remove DRM protection and convert DRM videos to Kids tablets friendly formats and move them to Kids tablets in an easy way. You can read the Review to learn more about the DRM Converter. ← How to Rip and Copy DVD to AVI for different uses on Windows PC? I am truly thankful to the holder of this website who has shared this wonderful article at at this time. Attractive section of content. I just stumbled upon your blog and in accession capital to assert that I get in fact enjoyed account your blog posts. Anyway I’ll be subscribing to your augment. Awesome site you have here but I was wanting to know if you knew of any community forums that cover the same topics talked about in this article?